And the answer to the question in my last blog is.... none of the above! I have started 1 new and 1 old project instead. Topper has been back in touch with me about doing another team for him. After some discussion we decided on doing an Orc team. I had already done Orcs for Veron using the existing GW metal team with a few minor conversion so didn’t want to repeat myself or use the 40K/Fantasy Orc Boyz since that has been done a million times before. I always have a few ideas for teams spinning around in the back of my head and one of these was to use the plastic savage orcs to make a Bloodbowl team. I’d seen a few of these before but most either didn’t look like Bloodbowl players or did not have sufficiently diverse positonals. The linemen were to be the most basic players, a very simple conversion of adding 40K Ork shoulder pads. They also got the mostly plain heads, my favourite of these guys is the player with both arms raised. I was concerned that the Blitzers and Linemen would look too similar to each other so took several measures to try and avoid that. They all got a single rounded shoulder pad, heads with topknots, lion cloths from 40K orcs and the punch daggers from the boxed set. These punch daggers were all on the left hand so I converted another 2 from weapons for the right hand to give them matching pairs. Black Orcs were another tricky prospect as they need to be sufficiently bulky to look ST and MA 4, but still retain the savage look. So I combined the Black Orc legs, gauntlets and heads with savage orc bodies along with Chaos Kinght shoulder pads. The throwers need to be easily distinguishable from the Blitzers and linemen too. In addition they are AV8 which is tricky to show when all the players have little armour. So I decided to use shaman since I see throwers as natural leaders anyway. One of the throwers will be made from this shaman with the right hand of a plastic thrower and a shoulder pad. The other is made from a normal savage orc with the head and left arm from the boar riding Wurzurg and right hand from a savage orc boar boy drummer. He still needs a shoulder pad added. I had got the forest goblins from the Arachnarok spider off e-bay ages ago and they were perfect for this team. One takes his left hand from a gnoblar spotter and a shoulder pad from a kroot warrior, whilst the other has the right hand from the same gnobalr and kroot shoulder pad. I can see him keeping close to the troll and yelling at it to get his attention when he goes Really stupid. The troll will be made from a Stone troll with a shoulder pad and maybe primitive fist spike, probably with a few extra bits added too. I like to theme stars to teams and felt no different with these guys. Half the stars uses items which seemed a bit technologically advanced for a tribe that don’t even use metal very much. So I needed to come up with alternatives. Urgoth will be made from the Plastic Savage Orc hero. 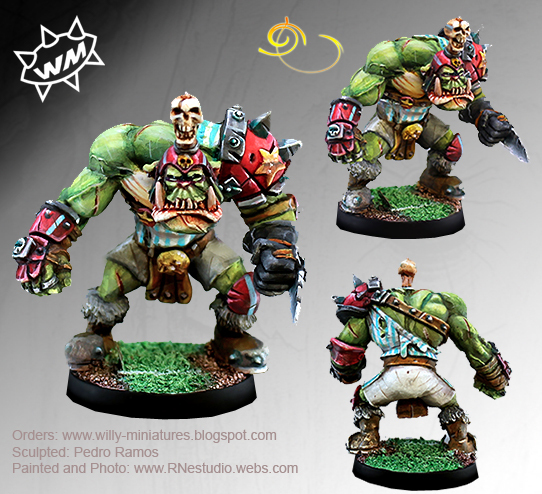 His chainsaw will be a large chainsaw shaped club with stone teeth, the -3 modifier to armour is brute Orcy strength! Ripper will be made from the GW model, likely with a few tribal additions. Varag will be the Willy Minaitures model, he already looks quite primitive so should fit in well, I may tweak him a little once I see what he looks like in the “flesh”. Morg will be the standard GW model too, but as he can play for lots of races he won’t be themed with this team. I will try and do something to him since the existing model is a little bland. The goblin stars would be forest goblins and I thought instead of secret weapons they should be using Squigs. Since squigs are already famed for being bouncey then Scrappa was easy, he will be made from a Squig Hopper with head and feet swap from normal forest goblins. Bomber needed a little more creativity and several ideas were rejected such as squig catapults, doom diver or him riding a 40K squig bomb. But I then saw the plastic attack squig with the grot boxed set and he gave me an idea. Instead of using explosives this bomber would set his attack squig on the enemy. With fumbles being it turning on him for interceptions and catches I could see that being opposing players booting the squig back the other direction. I have modelled him gingerly prodding the squig with a stick, there is another squig I could fit onto the base but it may end up a little crammed. He might be better suited sitting on the shoulder of one of the trolls. My initial sentence in the blog is not 100% accurate, I will be painting up one of those stars, Topper asked me to do Roxanna for his Dark Elf team too. I’ve also been contacted about the Norse Dwarf team to add some extra things to them. 4 more linemen, Zara, an apoth, a turn and score marker and a “plug” for the central hole in the display base when the big guy isn’t being used. The linemen will look very much like the other 7 I’ve already done. I’ll add some slight variation, since I always feel certain teams like Norse should be made up of individuals. Zara will be based on the standard GW model as I really like it (so another refugee from my last blog), I'll add wings to her helmet and maybe swap the stake for a spear or add some suitably Valkyriesque bits. The apoth will be made from models I got from the cannon crew since one of them has tools in his apron. It also comes with a clipboard which seems appropriate for a dwarf doctor. But as it’s bloodbowl I want him to be a bit brutal too, I was going to use the tongs but that is a bit too much like a dentist, instead I will give him a small curved blade. A face mask will be made from greenstuff and I’ll add one of those reflective discs round his forehead. I’ll paint his normal clothes either green or blue and his apron white with a prestigious amount of blood splatter. 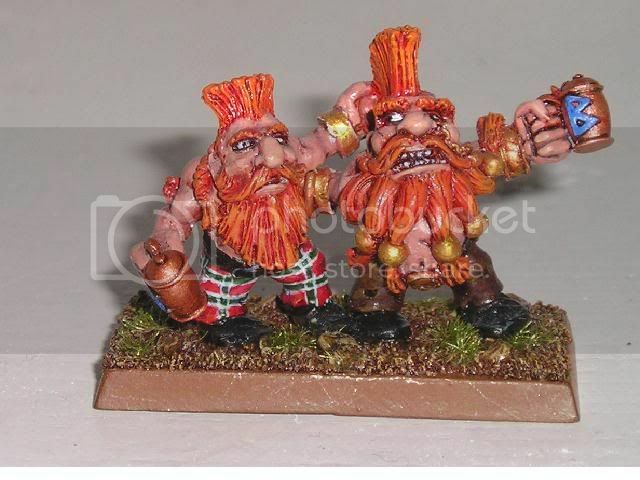 The turn marker will be made from a dwarf standard, in the photo this was a potential look for it as a flat marker. The score marker is using the standard top from the AoW dwarfs, since he’s holding dics it looks like he’s a keeping track of the score or stats. I will either paint “Home” and “Away” on them or “TD’s” and “Cas”. This was the other option with a marker being on a pole driven into the ice and I will go with that, as these can be used as small base plugs. The actual pole used will be much shorter, I just didn’t want to go cutting it up until I was sure. A flat base plug would be difficult to get out again so I am going to add a couple of drunken fans to the top of it. I will do something like these from my slayer army.